Background: One of my friends, a beautiful and vibrant young woman, ended up in hospital with severe deficiencies as the result of ‘raw vegan’ quackery. My aim is to promote the use of critical thought so that this does not happen again. The purpose of this article is to draw your attention to the true meaning of study and science. Personally, I have nothing against Harley and Leanne’s choice of lifestyle. On the contrary, I have been touched by the raw vegan idea, and have put a lot of thought into it well before their forum came to existence. I recall Leanne telling me that she got inspired by my fruity website when she first started. I had contributed a lot of material to their forum and supported it in various ways before my departure too. My intention here is to hopefully improve the rates of the application of rigor amongst the passionate raw vegan community. I firmly believe in the importance of applying curiosity, open mind, in asking questions, evolving and learning. To me, an awaken human being asks questions and challenges the stereotypes. I would like to emphasize that citing references, or blindly accepting reports that cite references, does not constitute science. Rather, science is about applying critical mind and reporting in an honest manner. This is not a domain reserved to people with degrees. Anyone with intelligence and an open mind is able to be critical and honest. 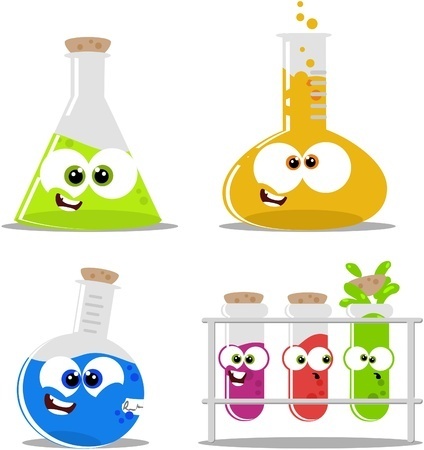 So, what does it mean to use science? What does it mean to perform a study? There are certain prerequisites that are part of both of those concepts. For example, one has to be objective, has to look at all the evidence and derive the conclusions after a rigorous, peer-reviewed analysis of the data, and in a manner that obeys the rules of logic. Conclusions before the analysis do not fall in this category by any means. Using the data selectively to support one’s claims won’t fit the bill either. Throwing out the data that does not support what we would like to believe, is a big no-no too. Just imagine for a moment someone performing a study of some method on a number of subjects. The standard is to test, observe, and then arrive at the conclusions. Then, the study goes through the scrutiny of the peer-review process and eventually, gets published. So, what about Harley and Leanne? How objective they are? Did they derive their conclusions after the analysis? Was there any analysis involved at all? And did they really derive their figures after “observing thousands of people over the period of years“? Did they include peer review in this process? In order to examine this, let’s have a look at the historical data below. 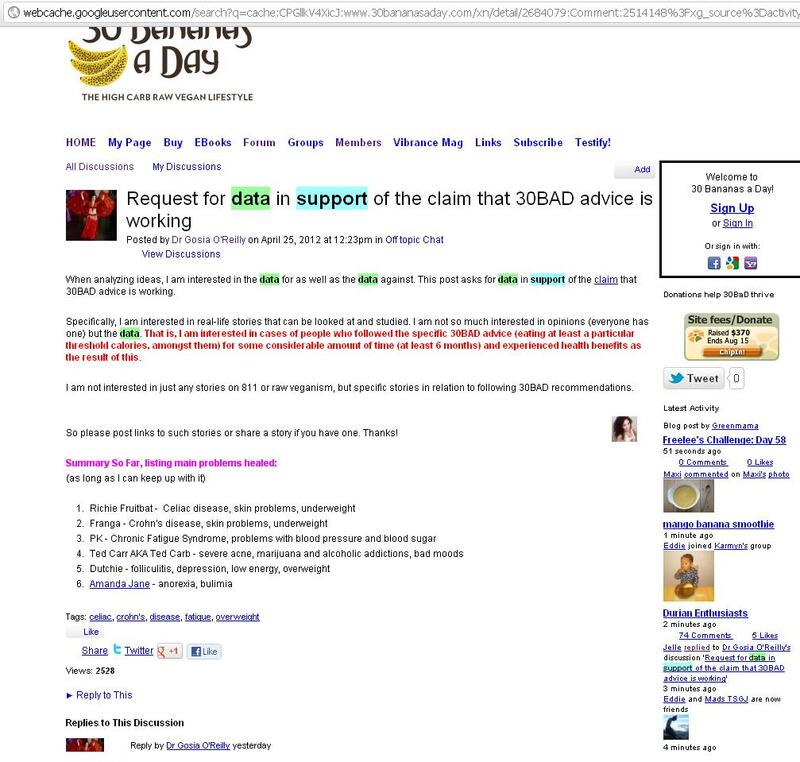 30BAD members were told that 3000 kcal a day is a minimum for everyone, regardless of their frame, age or activity level. They were told that you need to eat this much even if you were sedentary. I asked Harley a question about it in his Q&As videos once and he made it clear that this was the minimum, but did not give the specific details where that number was coming from. That is, there was no mention of any analysis, but his personal opinion. Harley dismissed this using reasoning such as, for example, that if you are not 100% raw then for sure this is because you are not eating 3000 calories per day. It was only a matter of time to illustrate the fallacy of this reasoning with his own as well as Leanne’s example, as they both have openly admitted to eating cooked foods at times. Before you get too excited about this little fact, please note that having some cooked foods, while eating a diet plentiful in fresh fruit and veggies, is not a crime. 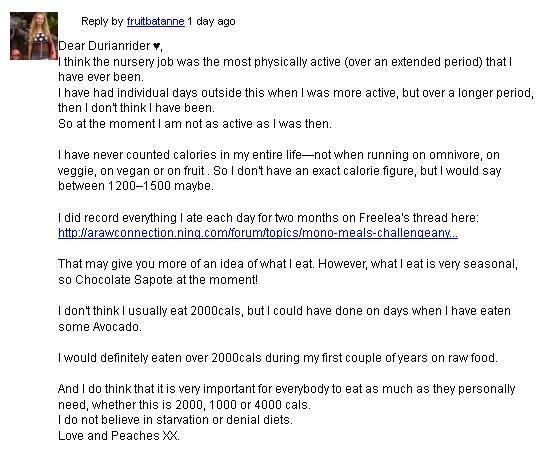 Once, someone made a post inquiring about how many calories everyone was actually eating, which as I recall was the closest attempt by anyone on 30BAD to have a look at some numbers (apart from my thread on long termers on the lfrv diet). There were definitely people eating amounts below the 3000 kcal minimum (e.g. 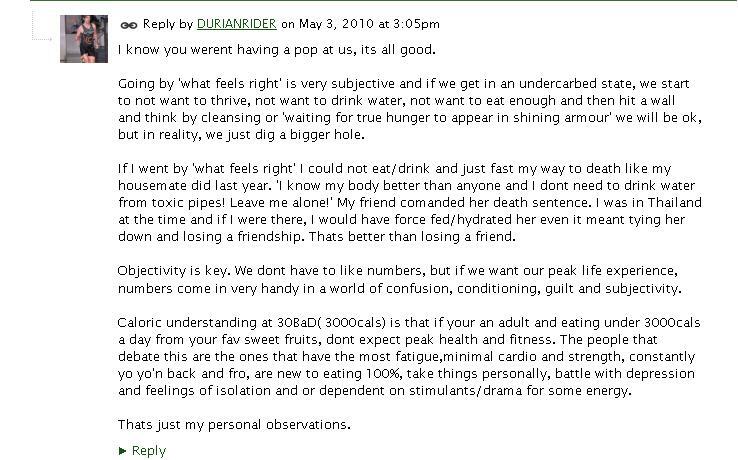 100% lfrv for 4 years and 11 months on 1850 to 1900 kcal per day intake), and we certainly did not have thousands of people following the 30BAD rules. 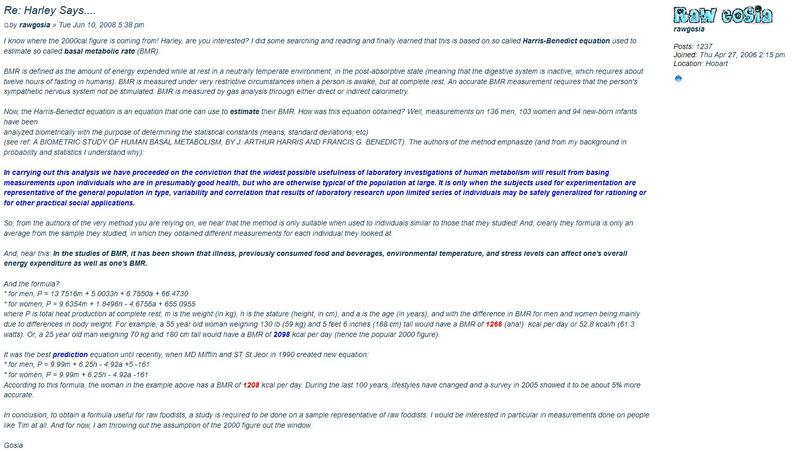 So when in April 2012 I asked a question about some evidence, I was thinking, OK, it is over 3 years now since the forum started, we should be able to see some measurable evidence, and it would be very interesting to analyze this. However, the amount of that evidence was not overwhelming. Instead, as I simultaneously asked a mirror question at this forum, because I wanted to gather some stories from within the whole spectrum, I discovered rather significant number of concerns. 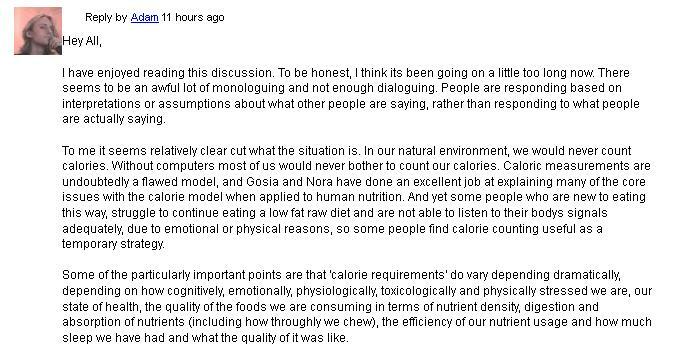 One should note by the way, that it is unlikely to be a mere coincidence that a scientist inquiring about the success rates of this diet should get banned for doing so from the forum. This is in agreement with the pattern of censorship reported by many members of the forum. This pattern is equivalent to discarding, from the evidence, all the data that is against what Harley and Leanne want to believe. Passionate? Perhaps. Scientific? Definitely not. 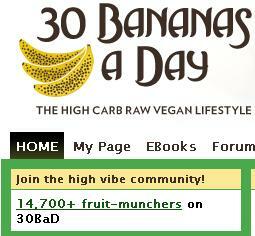 and so we should be seeing 11,760 stories of people eating 30BAD over 3000 kcal a day raw vegan diet. Further, If only 20% of those people were 2+ years long-timers, we should be seeing 2,352 such stories at least. One might say, oh, but we do have a large number of people succeeding on a fruit-based vegan diet. Perhaps we do. Note however, that we are not questioning here whether there are many people eating fruit and veggies on a predominantly raw vegan diet. Instead, we are questioning the success rate of the method that has been embedded as THE rule on the 30BAD forum since 2009. Further note that there have been changes in some of the things we have been hearing, for example 100% raw is no longer a strict recommendation in year 2012. In a recent picture by Banana Girl (Leanne), she advises to eat only 10 bananas, and includes a sizable amount of veggies in the plan. Seaweed, cooked food as well as gourmet raw foods are included in her food pyramid too. All miles away from what Harley and Leanne were saying in the past. Fair enough, I see no problem with that. On the contrary, I see them becoming more flexible in their approach, as an improvement. Nevertheless, the focus here is on the evidence that the method that they were claiming to be optimal since 2009, is actually working. In particular, note that changing the method when it is not working, and then claiming that the method has been working for years on thousands of people, holds no water. So we would like to apply some rigor here. Also, we ask, what is the reliability of the advice that you should do X method 100% when X is a random variable that is changing? What does it mean when you hear that you are failing because you were not following it 100%? What exactly is one advised to follow? As far as the current ’30BAD method’, it got closer to what people are actually eating, which is a positive outcome. The reality within the raw vegan community is that different people have been eating differently. There are significant individual differences between people’s preferences for types of foods or amounts of foods they choose to eat. Of course, our needs do differ and depend on many variables, and so it is perfectly logical to observe a lot of variety amongst the raw foodists, just as we do. What are the common factors amongst those that succeed in the long term? They eat foods they love, they eat a variety of foods and follow their desires. They listen to their body and do what works for them! That is, they do just what the long-term raw vegans were saying in the 2009 discussion mentioned above. Besides these intuitive explanations, there is a good science-based argument why listening to your body is an important mechanism of satisfying your body needs, see for example here. Also, as a side note, I found a really good article, an interview with Don Bennett, who talks about various important issues for raw vegans, which I highly recommend. Now, let’s go back in time just a little bit before January 2009 to see what led to the ‘3000 kcal a day’ conclusion, and transport ourselves to June 2008, roughly 7 months earlier. It is an honest response from Harley. Fair enough. 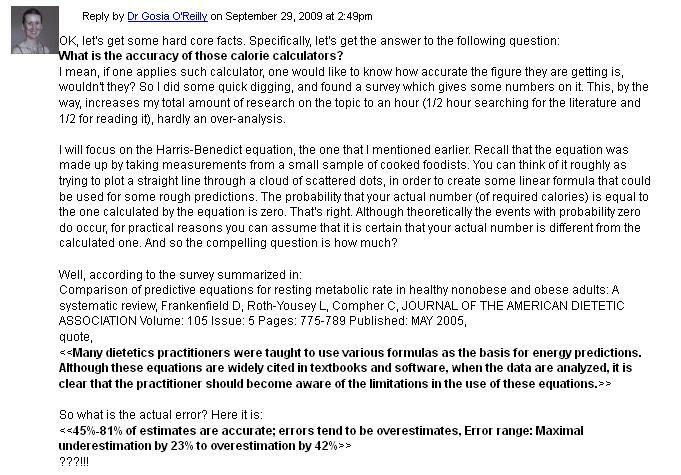 There is nothing wrong with not knowing the science behind the caloric calculators. Nevertheless, it is clear that the figures Harley was giving were not based on any amount of studies and thousands of people were not involved either. So, how many people were involved in the derivation of the January 2009 conclusion of the minimum 3000 kcal for everyone by Harley, in the 7-months time interval since June 2008? That is, there was no studies or rigor involved in the derivation of the 3000 kcal figure. This figure was a random number completely made up by Harley, with no scientific basis behind it. No science, but a personal opinion based on the observation of one person, his girlfriend. Similar was the case with the later used 2500 kcal figure for women. No study, just a randomly picked number without any analysis of the data. Everyone is entitled to their opinion. However, generalizations require the involvement of some careful thought. Why is it important? Because someone might get hurt. Now, let’s have a brief look at some examples of reference citing. I don’t think any academic has access to this sort of money. So the best any study could do is to make a hypothesis (eg 40% of US population is B12 deficient) and then test is using statistical means. Following this, any conclusions and discussion must involve probability theory and never certainty. In order to test such hypothesis, a random sample would have to be drawn from the whole population of the US. The sample must be truly random, without an introduced bias. A thorough analysis and discussion of the errors must be included. These requirements are based on standards within the theory of statistics, please refer to any university textbook on hypothesis testing for the details. Now, let’s have a look at the first-hand source in the form of peer-reviewed scientific papers that publish studies, in order to examine the matter further. Anyone can say anything on-line, for example that the Earth is flat (I just did), but we want to apply rigor. the first author of which is from Tufts University, reports Framingham Offspring Study. That is, the two separate studies that Leanne is mentioning are in fact one and the same study. So, let’s have a look inside the paper. In the abstract, we can read that the study was based in Framingham, and involved 2999 subjects. It was evaluated that 39 percent of them had plasma B12 levels in the “low normal” range–below 258 picomoles per liter. Also, an important conclusion was that the use of supplements, fortified cereal, and milk appears to protect against lower concentrations of B12. In particular, the study did not involve a random sample of the US population. The authors did not claim to have showed that 40% of US population are B12 deficient, and did not do so in relation to the population of Framingham either. In fact, the authors said that the subjects were “generally healthy adults“. That is, even people with levels in the “low normal” range may have vitamin B12 deficiency and so testing is recommended in general population, since there is a possibility that ‘low normal’ range may be more prevalent than it was thought. In particular, the 39 percent figure is the proportion of subjects in the study that were in the “low normal” range, which placed them in the risk category, but not the proportion of subjects that actually had B12 deficiency. Furthermore, the authors emphasized that “The data presented here clearly suggest that inadequate intake is an important contributor to low vitamin B-12 concentrations“. That is, the main contribution of the paper was showing that, unlike in previous studies, vitamin B-12 concentrations were significantly associated with total vitamin B-12 intake. Therefore, this conclusion places vegans in the B12 deficiency risk group, which is exactly what I read when reviewing the literature on B12 recently (here). The Tufts University study did not show that 40% of US population are B12 deficient. The Tufts University study clearly suggested that inadequate intake is an important contributor to B12 concentrations. This places vegans in a risk group. Let’s now move to another important aspect of science-based analysis, the application of logic. Population of humans: 7 billion (roughly). Population of those who followed 30BAD 100% for (say) at least 10 years: 0 (precisely). Has Harley or Leanne been 100% themselves? : No (public knowledge). You can find more examples than what has been discussed above, but the aim of this post is not to make a comprehensive list. The main point that I am trying to make here is that such arguments are invalid and have nothing to do with science. If you cite references, make sure to read them. On-line articles or books may not be a reliable source, so check the source reference first-hand. Relying on peer-reviewed references is a good idea. Cite references without making changes to suit your beliefs. Don’t make unsubstantiated claims yourself. Be careful and honest in your reporting. If you feel out of depth, check with someone specialized in the area. Make sure to question those who make claims. Ask for evidence that is based on more than just an opinion or anecdotal data. Don’t treat anyone as an infallible guru. Be critical, ask questions and think for yourself. And, finally, we ask, why as a raw vegan educator should you care about applying critical mind and rigor? Well, if you don’t, then you might risk being seen as a quack, which in turn leads to an association of quackery with the very idea you want to promote. Quackery: advice based on observation and experience in ignorance of scientific findings.